I hadn't expected to be able to watch this film at a local movie theater but yay, Yarn the Movie came to Houston TX this week as part of the Houston Cinema Arts Festival. A friend of mine shared details of the upcoming film to my Facebook page. I would have completely missed it! This documentary, made by Montreal-based Icelandic director Una Lorenzen interweaves the stories of four inspiring artists who work with yarn. The film is as visually gorgeous as I'd expected. It starts off in the best way possible with Icelandic lopapeysa sheep (I love sheep, don't you?) and then moves from Iceland to many different locations worldwide showing examples of the four artists' fantastic work. I was already familiar with two of the featured artists: Brooklyn-based Polish crochet graffiti artist Olek's and Japanese artist Toshiko Horiuchi MacAdam who makes amazing giant crochet playgrounds. The film also features the charistmatic Icelandic graffiti artist Tinna Thorudottir Thorvaldar and Tilde Björfors, the founder of the Swedish circus company Cirkus Cikör. 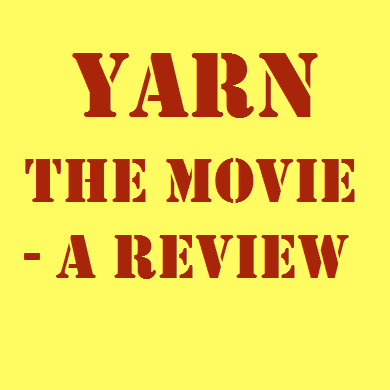 The best part of the film was listening to these amazing women talk about what yarn meant to them. There was too much to digest in just one viewing so I'll be putting the digital pre-order on my Christmas wish list. 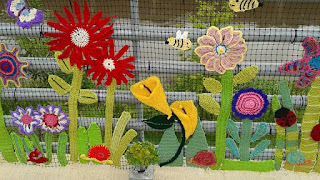 There was a discussion afterwards with Mary Goldsby, founder of Urban Yarnage, a Houston-based group of knitters and crocheters who design and develop fiber street art projects. The audience, having just watched the film, were eager to hear how they would go about yarn bombing Houston. 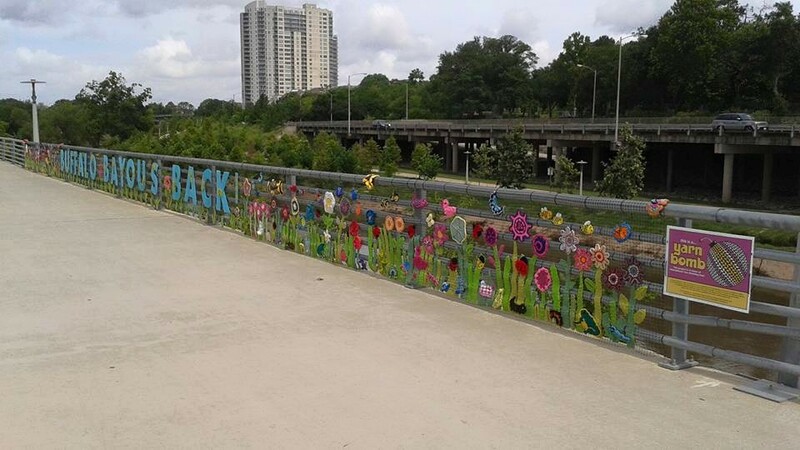 Last year I was lucky enough to see their Buffalo Bayou project created in celebration of International Yarn Bomb day June 11th 2016. Gorgeous! I'd love to know in the comments below if you've seen the film and what you thought! I will look into your pre-order link because I doubt the movie will make it to my town. I love the yarn bomb pictures you have included in this post. I woukd line to do something similar for Maker Faire one year since the current site has a proliferation of mesh fencing at the moment. I know you'll enjoy the film Jodie! I was so happy when I spotted the yarn bomb in Houston last year. 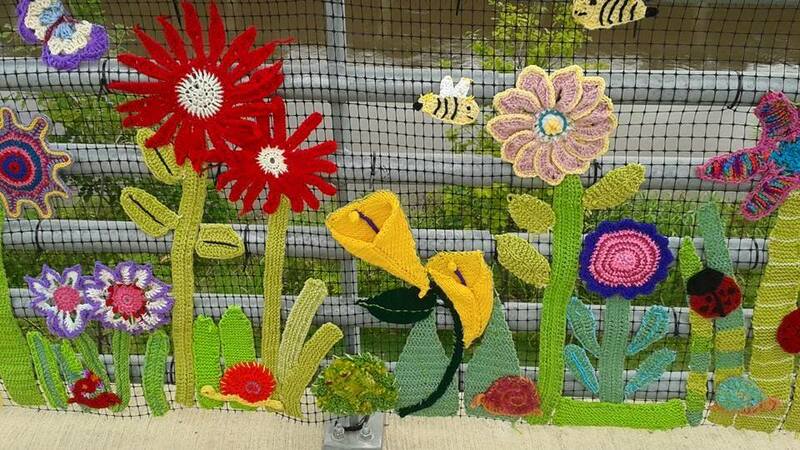 Mesh fencing seems like the ideal place to put crochet creations!! I contacted the organisers and there are no plans to bring the film to South Australia as yet. It was suggested that I start a campaign using Tugg but that kind of activity is beyond me with my current commitments and energy levels so I will wait until the dvd release in January and hope that it is in a format compatible with my region. OK I hope the format is compatible, Jodie. It is a super film!